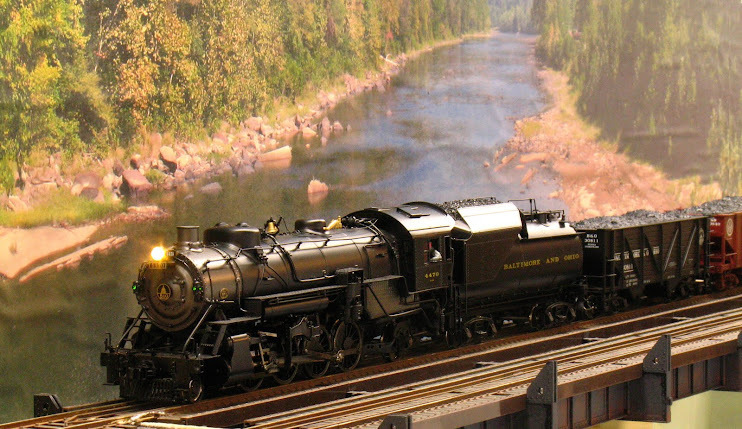 I installed a Lenz Gold Maxi decoder in an O-Scale Weaver die-cast USRA Light Pacific. In spite of the loco's cheap Mabuchi RS-385 motor and simple gearing the results are pleasing (to me anyway). I have timed the loco at speed step 1 to take 49-50 seconds to travel one foot, which calculates to 2/3 scale mile per hour. Not too shabby. I did nothing to the decoder except install it, I did not program start voltage, speed tables, etc., this is as it comes. BEMF was turned on from the factory. In the first segment you can see the loco at speed step 1 traveling past a 1 foot ruler propped up beyond the track. The oblique angle makes accurate timing impossible, but you can see that it takes some time. In the second segment, I show a close-up of the valve motion demonstrating the smoothness of the motor control. The Lenz decoders have something called 'yard mode' which cuts loco speed in half and can be turned on and off using F3 (mappable). In the third segment I start the loco at speed step 7, engage yard mode part way through the segment, then disengage it. Finally, the last segment shows the loco coupling to a converted K-Line die cast hopper at speed step one - no slam-bang here. My miniature brakemen will be perfectly safe. I probably could improve low speed performance with some tinkering with the decoder settings, but as it is this is a vast improvement from the straight DC performance.